The finished chess board. Sit down, relax and do battle! I fancied a game of chess but found my board had been on the receiving end of one of my dog's chewing fits. 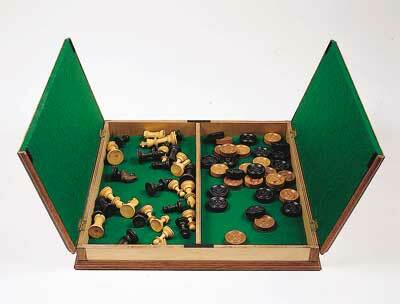 This prompted me to make a fun project for games designed to sit on a table, with lift up lids and two compartments for chess or draughts pieces. It is 380mm (15in) sq. excluding the edge mouldings, with a piece of 9mm (2 3/64in) birch ply for the top, as it is strong and will resist any tendency to bow when the sawn veneer squares are glued in place. 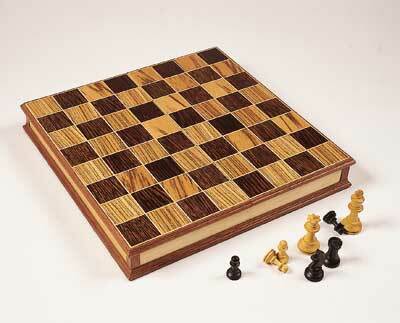 The base is a piece of 6mm (15/64in) hardboard, rigid and easily covered with baize or felt on the inside surface. 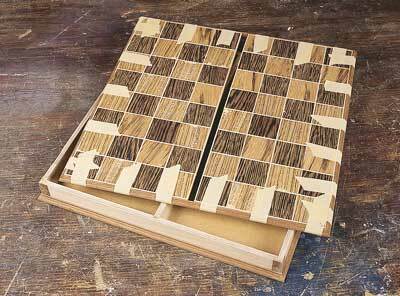 The shallow birch ply sides are sandwiched between the top and bottom, needing to be just deep enough to hold the chess pieces with the largest diameter bases, about 38mm (1 1/2in). The sides and centre division are tongue-and-grooved together using a 4mm straight cutter. Offset the tongues to the inside face of the sides, and in the case of the division, do the same, just take care when marking out that the division is centred even though the tongue and groove isn't! Aim for a tight but not forced fit. Glue all the joints and hold together with veneer pins which can be punched in later. Check the sides and division are square, and leave to dry. Glue and pin on the base, cleaning off any glue showing on the inside. 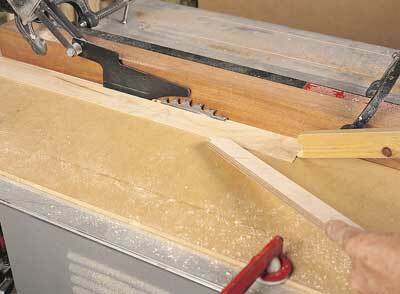 Once dry, punch in the veneer pins and fill, use a block plane to flush the base if it overhangs anywhere. Belt sand the outside faces using 120-grit to get a clean finish. For the top, take the ply square and use the table saw to bisect it down the middle. 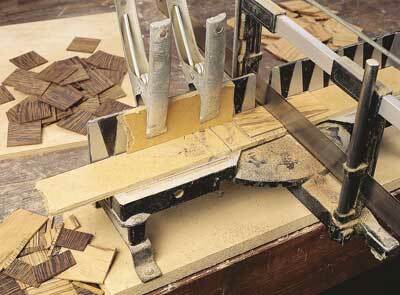 The loss of the saw kerf width can be made up with a strip of a suitable wood later. Choose some dark and light timbers to form the alternate squares. I bought a cheap box of offcuts by post from Craft Supplies of Derbyshire. These are intended more for turnery, but many are large enough for this purpose. Measure the total area of the two boards and divide by eight to arrive at the square size. Note that the maple inlay does not need to be taken into account at this stage, as we will simply rout a groove along the junction of all the assembled squares. 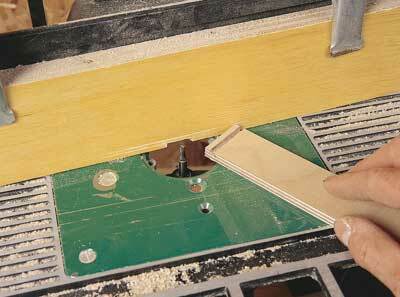 Set up the table saw for producing approximately 3mm (1/8in) thick sawn veneers. How you do this is important for safety and consistency, so make sure that you use pushsticks and follow a safe procedure. Prepare plenty of thin flat strips to make the squares, also cut lots of thicker sections of the maple for thicknessing, ready for the inlayed lines. 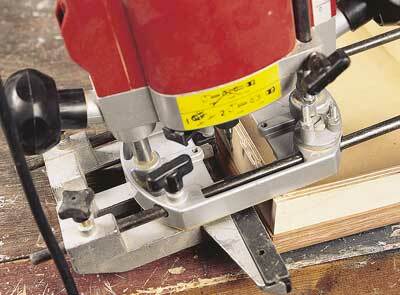 A hand mitre saw is a quick, easy way to cut the strips into squares. Put a strip of MDF on the bed to support where the cuts are made, then clamp another piece on the fence as a stop. 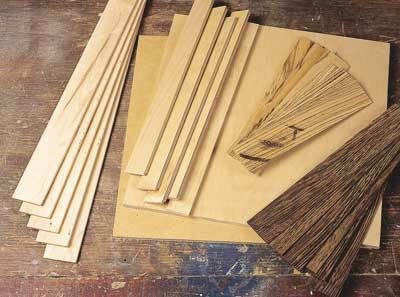 Cut lots of each colour wood until you have a bit of an excess, then choose the best looking ones. Lay them alternately on the two boards. Ensure the first playing square at the bottom left-hand corner as you face the board, with the join running across, is a light square and the grain runs crosswise. Check for grain match, and slide them off in the right order. Use a spreader to apply PVA glue all over the boards. Lay the pieces back on one by one, pressing them tightly together and down onto the boards. Use some packing tape to hold all the squares together. Make sure they line up flush and parallel with the underlying boards, and cramp both boards firmly face-to-face, sandwiching a piece of paper in between to prevent them gluing together, and leave to set. Depending on how well-sawn to thickness the veneers are, you can either get away with a thorough belt sanding to level the squares, or if more needs removing, some very fine passes through the thicknesser can be tried. This may cause a bit of tearing if there is short or angled grain. 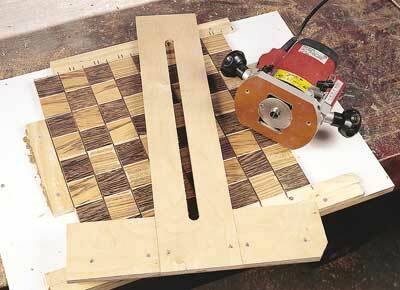 Make up a jig board with one long stop to press the two playing boards against. Line them up to each other in their correct playing order so the cross-grain direction of the squares will be grooved first. 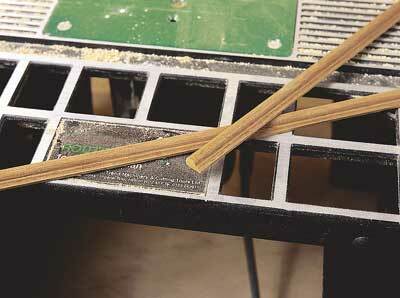 Screw strips against the other edges of the boards to hold them tightly together. 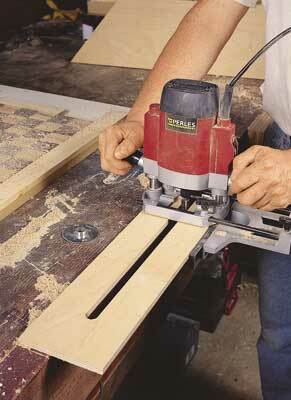 Make up a T-square for the router which sits right across both boards, with a slot big enough to admit a guide bush. 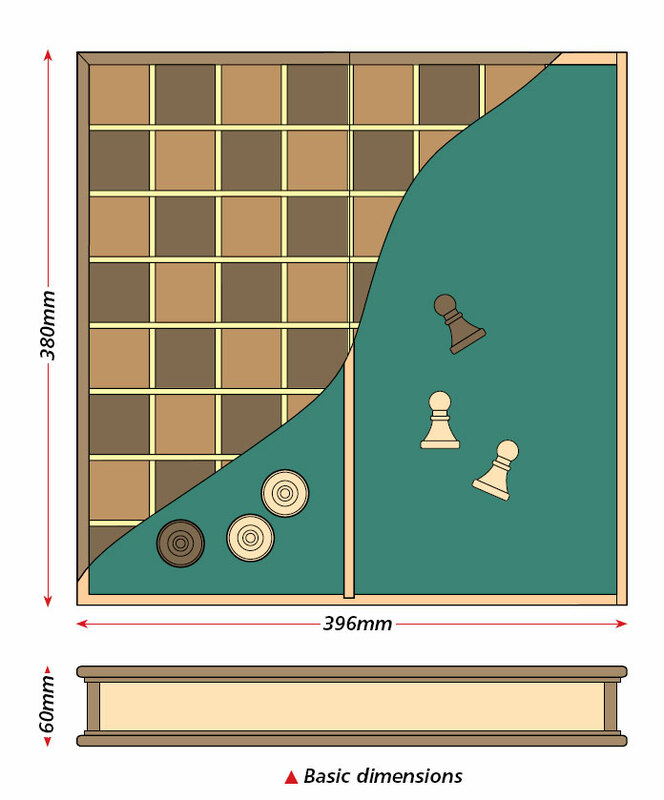 Screw two squares of board either side, overhanging the chessboard so cramps can be applied to the T-square to hold it in place. Make sure the guide bush slot is exactly 90 degrees to the right-angle piece fixed to the T-square. Line the T-square up on a joint between two squares, fit a 2mm straight cutter in the router and set the depth to that of the veneer. Rout along the join, working backwards and forwards several times till the chippings clear out of the slot. Repeat this along all joins and the outer edges too, also making sure to centre the cutter on the edge of the squares. Take the sawn maple strips and thickness to size, taking repeated fine passes through the thicknesser until you reach a size that will, edgeways, fit fairly easily into any of the routed grooves. Now use your tablesaw set-up to cut these flat strips into nearly square sections, take care, using two pushsticks and no fingers. 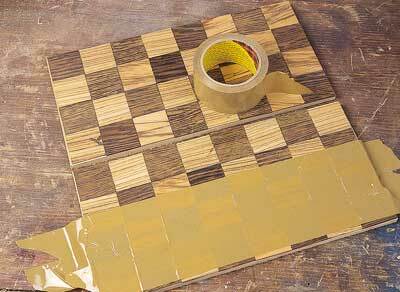 Apply glue to the grooves and tap the inlay evenly down with a hammer, tape it on the outer edges and leave to dry. 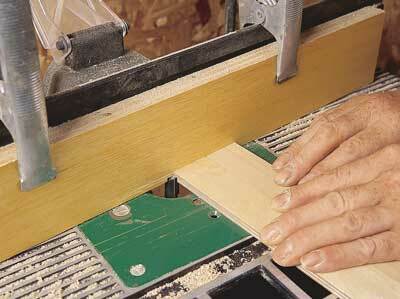 Trim off the ends of the maple strips and use a finely-set block plane to level the inlay without tearing the squares. Rotate and refit the boards in the jig, but with the long grain direction facing you. You'll need to adjust the strips holding them. Repeat the machining procedure and once again glue the inlay into the grooves and let dry. Trim and level the inlay, belt sanding with the grain. The board is complete. Make up some classical section moulding in a contrast wood to place around the base edges, covering up the hardboard and around the edges of the playing boards. Cut neat mitres and glue and tape them in place. Treat both boards as one with a gap in between so the mouldings line up, and to cover the ends of any infill strip needed to make up the width of the top. The top moulding should hang down about 1mm more than the top thickness. I found the mouldings projected over the box sides enough for the loss of a saw kerf width not to be noticeable. 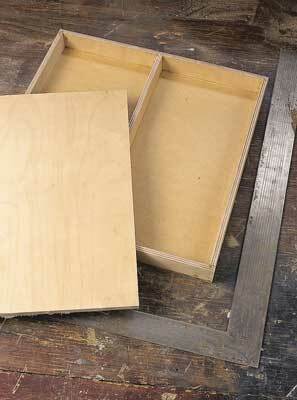 At the corners of the box glue some strips of thin sawn or knife-cut veneer to cover the birch end grain. They also are an added feature. The hinge recesses could be routed with a jig, but this seems a bit heavy handed as the hinges are so small. Instead, fit a 3.2mm straight cutter and fence, knife-mark around a hinge to give an accurate shape, and gently machine out to the depth of half a folded hinge. The hinges can't be recessed into the lid, but the hang down of the moulding will cover them. Fill any defects and sand the playing surface with an orbital sander. Hand sand all other seen surfaces using 220-grit or finer. Apply sanding sealer in several ragged-on coats and rub down between coats using 400-grit lubricating paper. Apply a good wax, but not on the lid underside, the base or the inside base which will all be covered in baize. Use an adhesive like Copydex to glue the baize or felt neatly onto these surfaces. Use some tiny screws to fix the hinges in place and some small strips of Velcro on the box edges to keep the lid closed. It doesn't matter if you aren't a master craftsman, because now is the chance to imagine you're a chess Grand Master instead! 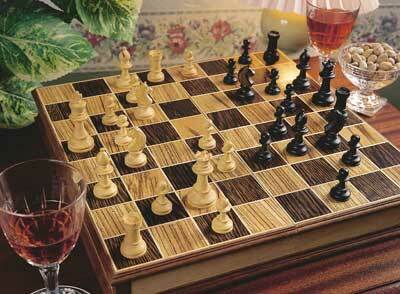 "Now is the chance to imagine you are a chess Grand Master!"